In the competitive pursuit of capturing the attention of HNW and UHNW investors, wealth management is missing an opportunity. It’s a glaring miss. Almost an open goal-level miss. That “miss” is the world of engaging by video. This concerns us. Hugely. So much so, we have decided to do something about it. Ever since motion pictures were invented they have had the capacity to stop viewers in their tracks. They can make people laugh, cry, dream, think, communicate and act. And businesses across most industries have harnessed this emotional power to connect to their consumers. It is strange that wealth management has been so slow on the uptake when it comes to using video content in marketing, given that wealth is 10% financial and 90% emotional. After nearly two decades of tracing the behaviours of HNW and UHNW investors, it is clear video is probably the single biggest opportunity. The industry is likely to initially deny the importance of videos; however we are going to force this up the agenda because we know of the significant impact it will have on the bottom line for our wealth management institutions. 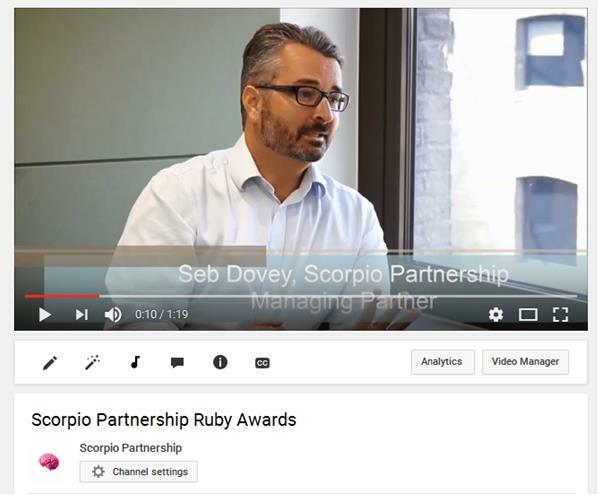 To do this, we launched the Rubies – in a nutshell, it is the Oscar award for wealth videos. For a quick introduction, click on the picture below to watch our vlog featuring Seb Dovey. With a small judging panel drawn from the worlds of wealth management, branding, PR, client experience, research, and technology, we reviewed a short list of 10 video-based motion pictures launched in 2015 that address wealth management. A number of factors were assessed, including the engagement the video content inspired, the empathy it generated with the viewer, its memorability, and most importantly, its call to action. We used this to narrow our list of wealth-Spielberg’s to just five adverts, which we then shared with a panel of 400 HNW individuals from the UK and the US. Results from this survey showed that although the ads were not the easiest to understand for most viewers, the impact was overwhelmingly positive. 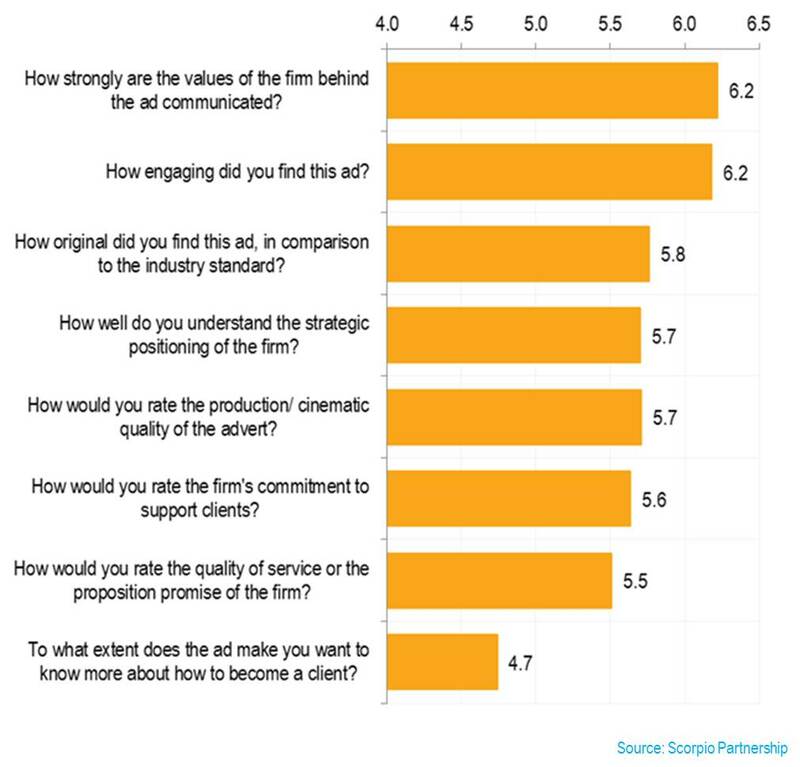 Nearly three quarters of them said they were likely to speak to their friends and family about the advert and a similar amount stated it made it more likely for them to invest with the wealth manager represented. Figure 1: Thinking about the advert you have just seen, please indicate whether you agree with these statements? It all sounds very positive, until we dig deeper. Actually, it appears that the adverts were positively received on a superficial level. Viewers found that the content did not help them to understand the brand’s strategic positioning nor did it give the firms an image of high quality service. And, when asked to what extent the respondent would like to know more about becoming a client, the score was a meagre 4.7 out of 10. The captains of industry in cars, luxury, telecoms, travel and so on have been quick to grasp that videos are an important source of lead generation and have harnessed it to full advantage. We try to do the same. In fact, whenever we present at conferences around the world and we use videos we can guarantee a major uptake in audience attention and engagement. Our ratings rise. The opportunity here is to grab the first mover advantage to improve video-based communications, and now we have given you the knowledge on where the gaps are. The Rubies are going to be supported by a leading global industry publication, and we think, in the long run, the Rubies are likely to have as much of a draw as the wider awards that they already run around the globe. And finally, would you like to know who the winner was? We have even provided you with the finalists’ video links so that you can go on and watch the videos themselves. Get some popcorn. Education: Ruohan holds a Bachelor’s degree in Joint Honours Economics and Finance from McGill University. 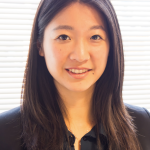 Role with us: Ruohan joined Scorpio on the graduate scheme. She works on a variety of projects and has recently conducted quantitative research analysis for thought leadership initiatives and client experience surveys. And at the weekends: Ruohan enjoys playing the piano and looking out for anything Canadian-related in London.